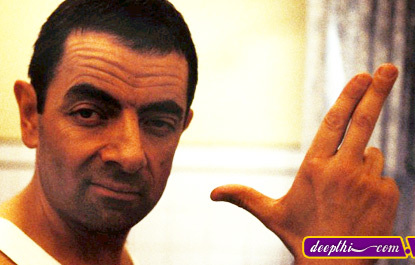 Best known to American audiences as the Black Adder and Mr. Bean, black-haired, bug-eyed, and weak-chinned comedian Rowan Atkinson is one of the most popular funnymen in England whose keen, often black humor and knack for physical comedy has earned him a huge international following. Born in Newcastle, Atkinson was educated at Newcastle University and Oxford. While at the latter, he teamed up with budding screenwriter Richard Curtis to write comedy reviews for the Oxford Playhouse. Shortly thereafter, the two created material for the Edinburgh Fringe. By 1978, Atkinson's humor had earned him a devoted fan base and he was offered leading roles in two British television comedies. Instead, Atkinson chose to get involved in the internationally acclaimed comedy series Not the Nine O'Clock News as a writer and a performer. His performances in the oft-distinguished show earned Atkinson a British Academy Award and got him designated "BBC Personality of the Year" in 1980. His stage performances also continued to significantly increase his popularity. British comic actor and writer, born in Newcastle upon Tyne, Tyne and Wear, NE England, UK. He studied electrical engineering at the universities of Newcastle upon Tyne and Oxford, first appeared in Oxford University revues at the Edinburgh Festival Fringe, and in 1981 became the youngest performer to have had a one-man show in the West End. Subsequent appearances include The Nerd (1984), The New Revue (1986), and The Sneeze (1988). Television roles include Not the Nine O'Clock News (1979�82), Blackadder (1983�9), The Thin Blue Line (1995�6), and Mr Bean (from 1990�4, 1996 in the USA). Film credits include Four Weddings and a Funeral (1994), The Lion King (voiceover, 1994), Bean: the Ultimate Disaster Movie (1997), and Johnny English (2003).